The surveys showed that making purchase decision not only depend on product quality, but also based on customer service. And Delivery Date is an important factor of customer service. 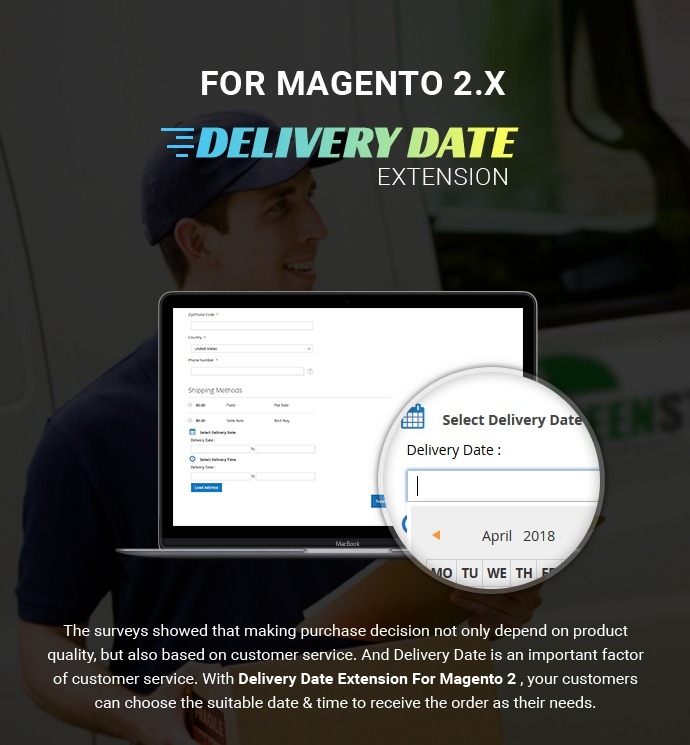 With Delivery Date Extension For Magento 2, your customers can choose the suitable date & time to receive the order as their needs. + Able to set up the delivery dates & time as wish. Especially, you can set up the delivery date and time follows each city. 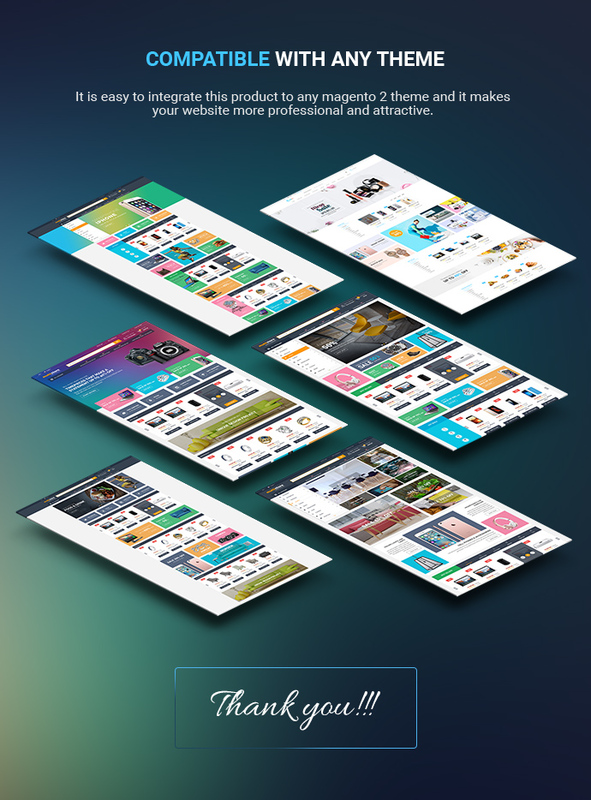 + Customize layouts to be suitable your website. + Display the extra information about delivery date & time in detail order page of the back-end. 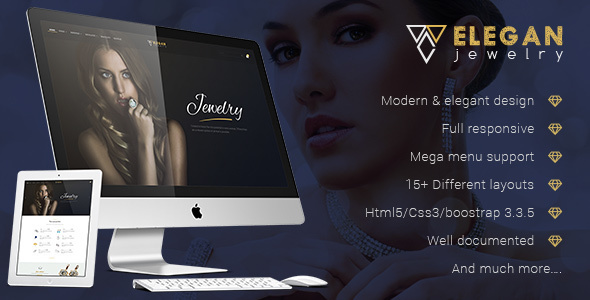 + Improve user-experience on your store site. + Let your customers specify the suitable date & time for product delivery while checkout process. + Maybe leave the special comment to be convenient for delivery process. Step 2: Add a product to cart: Go to the detail of product you want to buy and choose option (if any). Then, you click on the " Add to Cart" button to add the product to cart. Step 3: Go to Checkout step: In step 1 of the checkout process, you fill full information in Shipping Address and select shipping method. 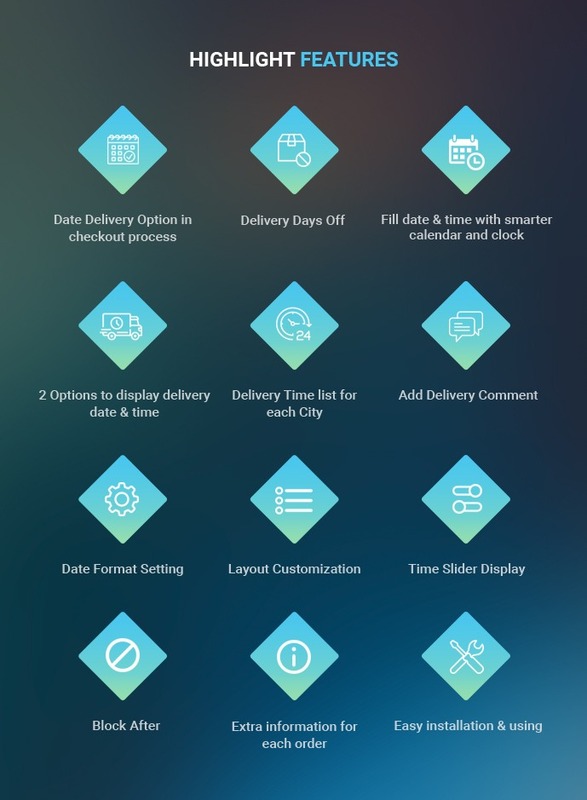 But in shipping method, you select date & time for delivery in the delivery date field and add comment delivery in the text box "delivery comment". 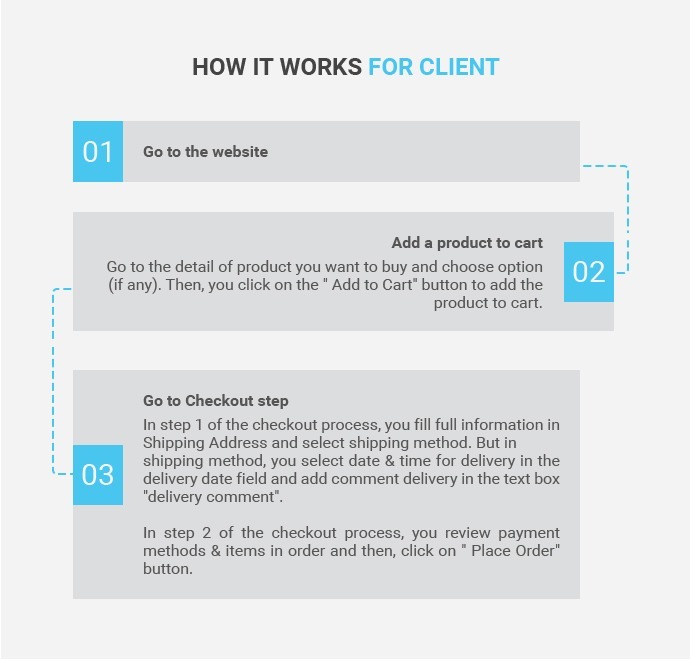 In step 2 of the checkout process, you review payment methods & items in order and then, click on " Place Order" button. Step 2. 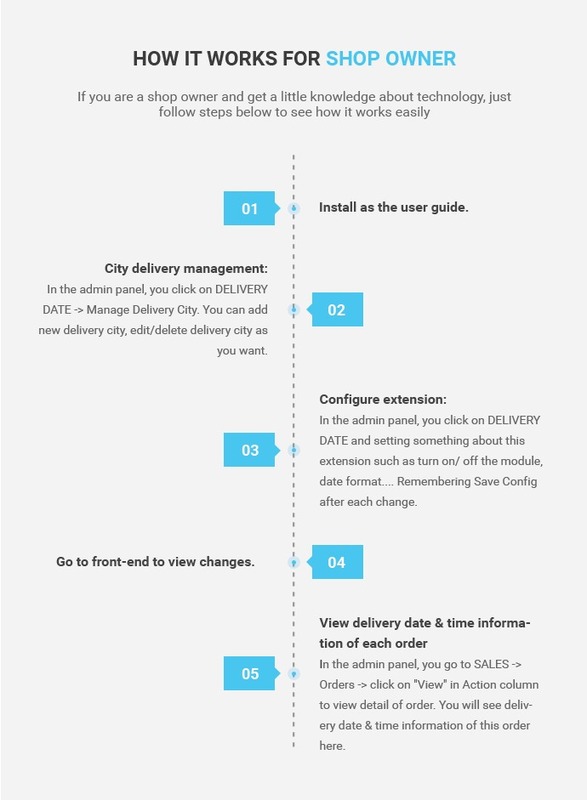 City delivery management: In the admin panel, you click on DELIVERY DATE => Manage Delivery City. You can add new delivery city, edit/delete delivery city as you want. Step 3. 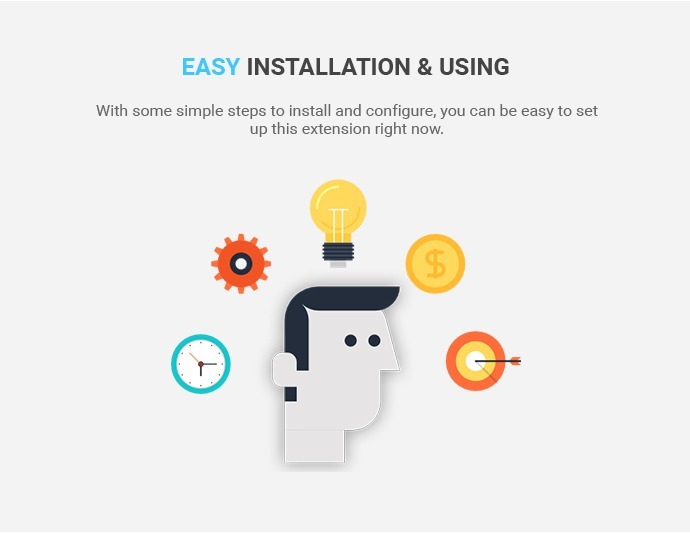 Configure extension: In the admin panel, you click on DELIVERY DATE and setting something about this extension such as turn on/ off the module, date format.... Remembering Save Config after each change. 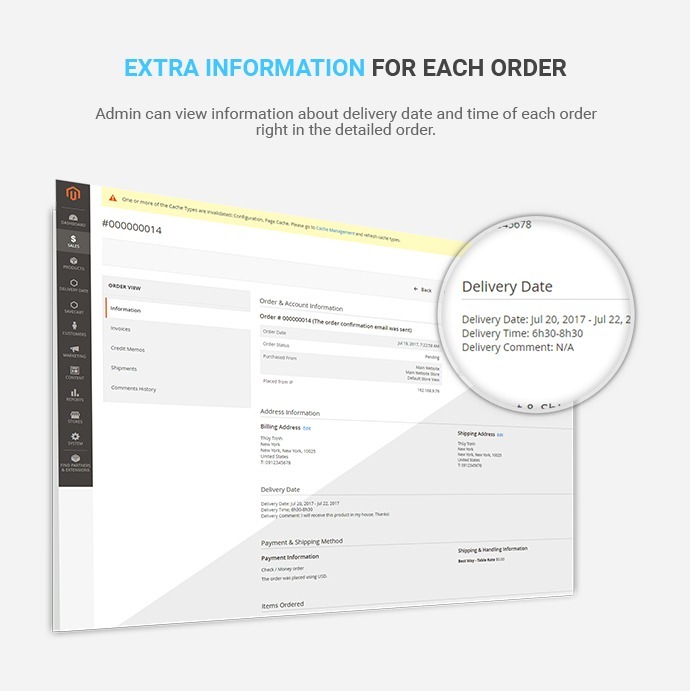 Step 5: View delivery date & time information of each order: In the admin panel, you go to SALES => Orders => click on "View" in Action column to view detail of order. You will see delivery date & time information of this order here. 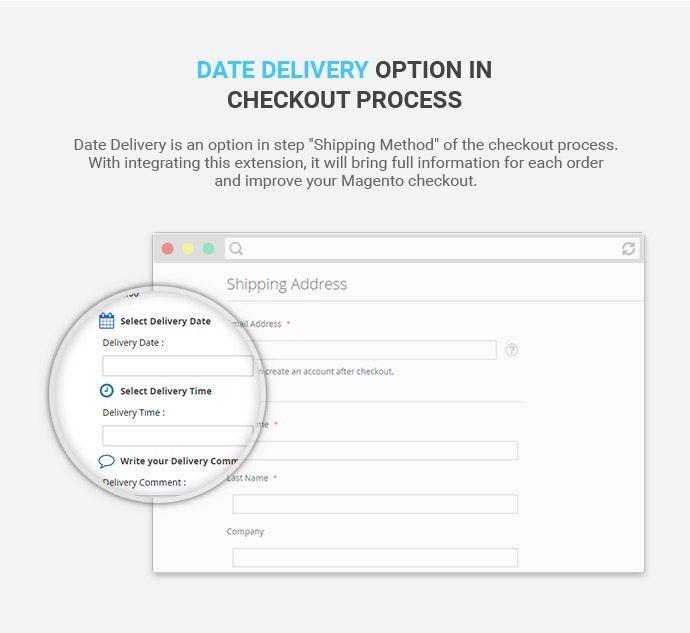 Date Delivery Option in checkout process: Date Delivery is an option in step "Shipping Method" of the checkout process. With integrating this extension, it will bring full information for each order and improve your Magento checkout. 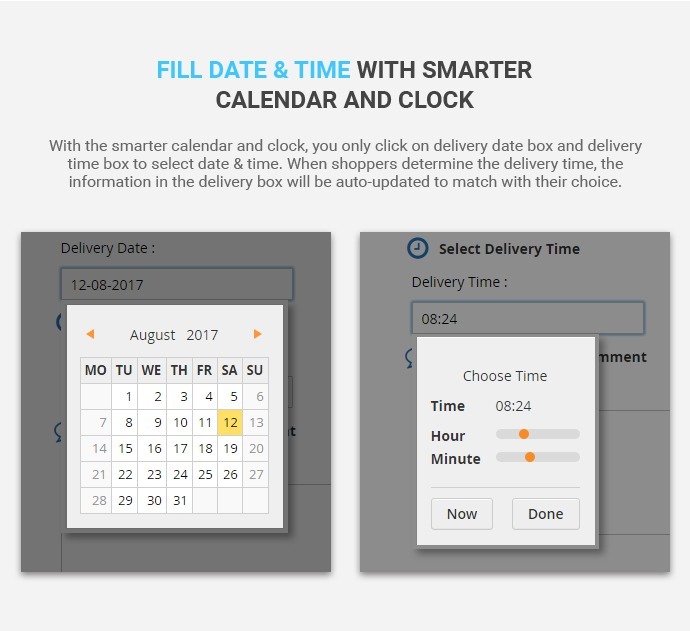 Fill date & time with smarter calendar and clock: With the smarter calendar and clock, you only click on delivery date box and delivery time box to select date & time. When shoppers determine the delivery time, the information in the delivery box will be auto-updated to match with their choice. 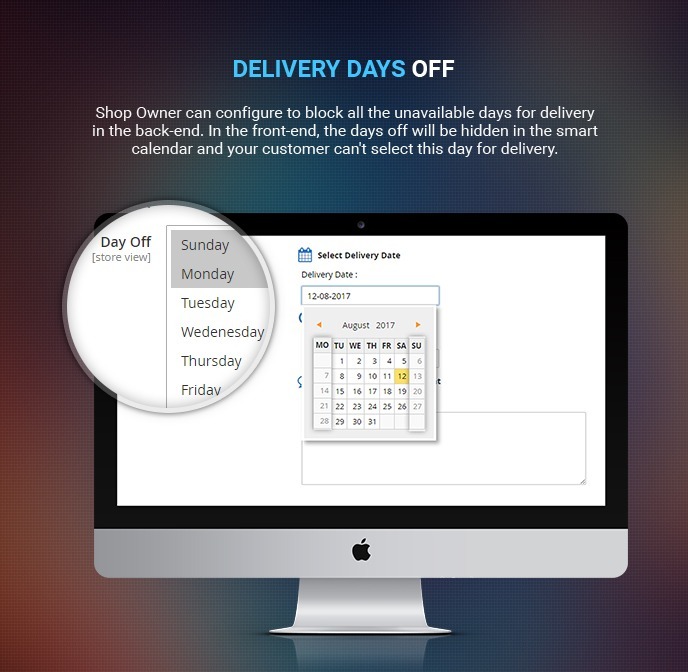 Delivery Days Off: Shop Owner can configure to block all the unavailable days for delivery in the back-end. In the front-end, the days off will be hidden in the smart calendar and your customer can't select this day for delivery. 2 Options to display delivery date & time: Admin will have 2 options to display delivery date & time in front-end: display one field (only one field to select the date and one field to select time) or display From To (each date or time will be divided into 2 fields: date from & date to or time from & time to). 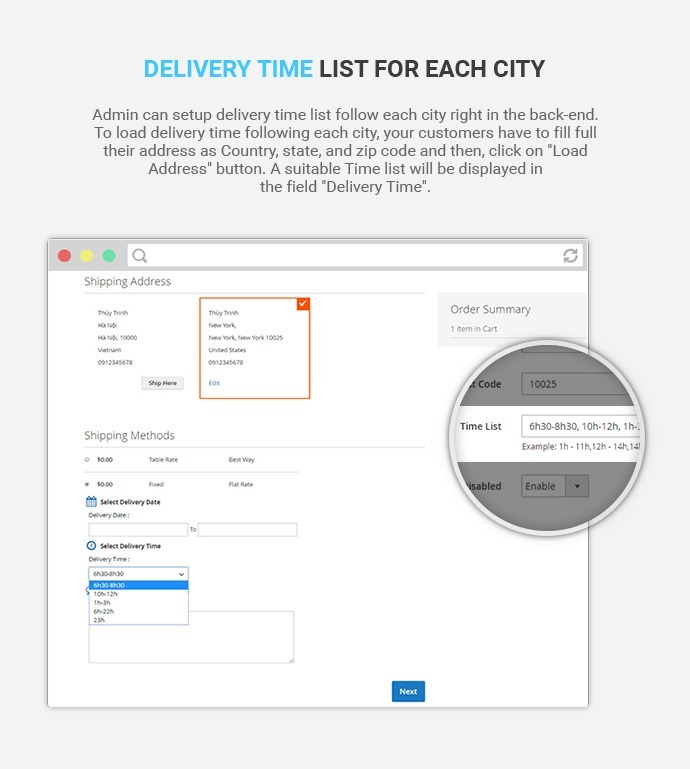 Delivery Time list for each City: Admin can setup delivery time list follow each city right in the back-end. To load delivery time following each city, your customers have to fill full their address as Country, state, and zip code and then, click on "Load Address" button. A suitable Time list will be displayed in the field "Delivery Time". 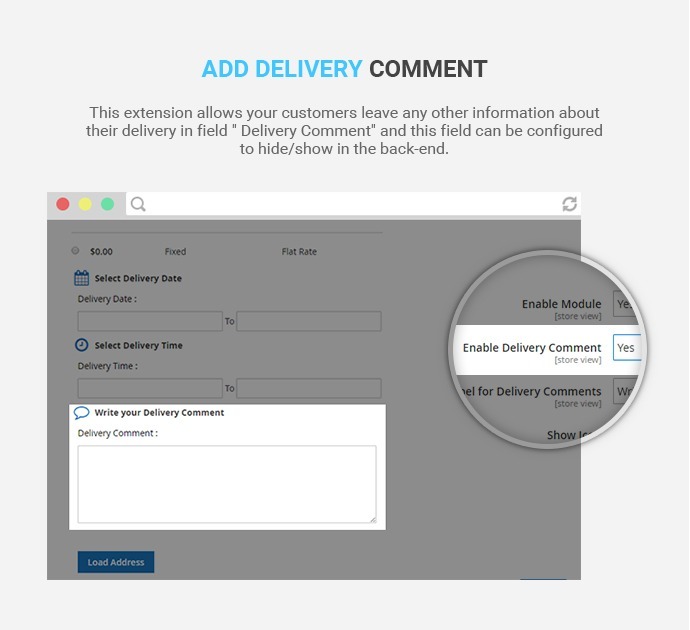 Add Delivery Comment: This extension allows your customers leave any other information about their delivery in field " Delivery Comment" and this field can be configured to hide/show in the back-end. 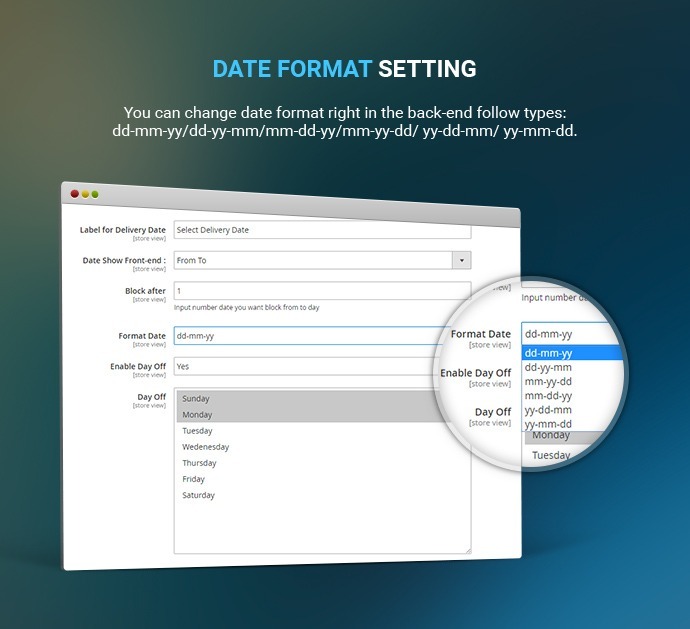 Date Format Setting: You can change date format right in the back-end follow types: dd-mm-yy/dd-yy-mm/mm-dd-yy/mm-yy-dd/ yy-dd-mm/ yy-mm-dd. 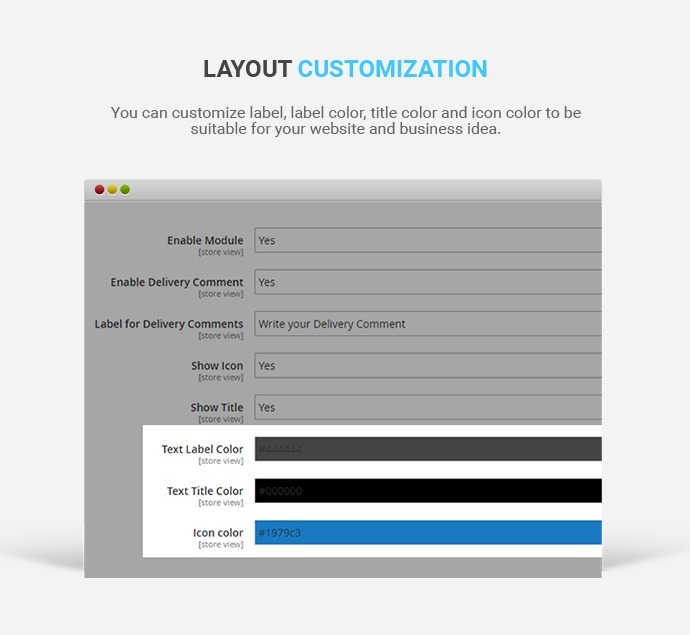 Layout Customization: You can customize label, label color, title color and icon color to be suitable for your website and business idea. 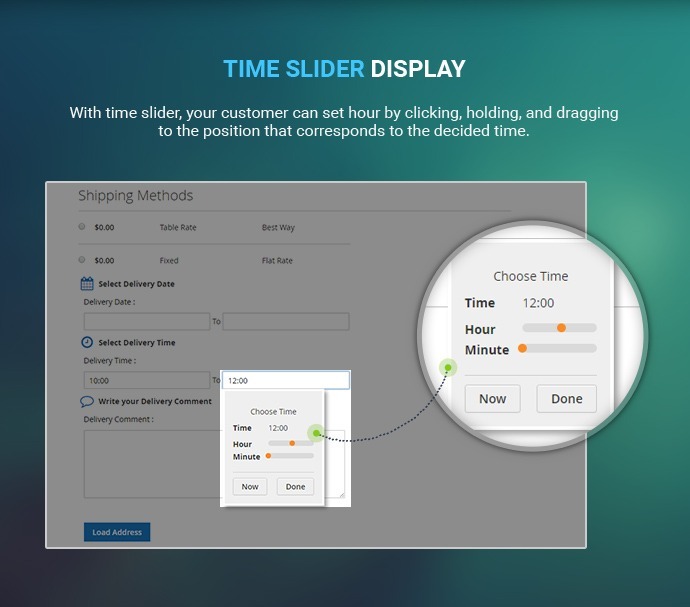 Time Slider Display: With time slider, your customer can set hour by clicking, holding, and dragging to the position that corresponds to the decided time. 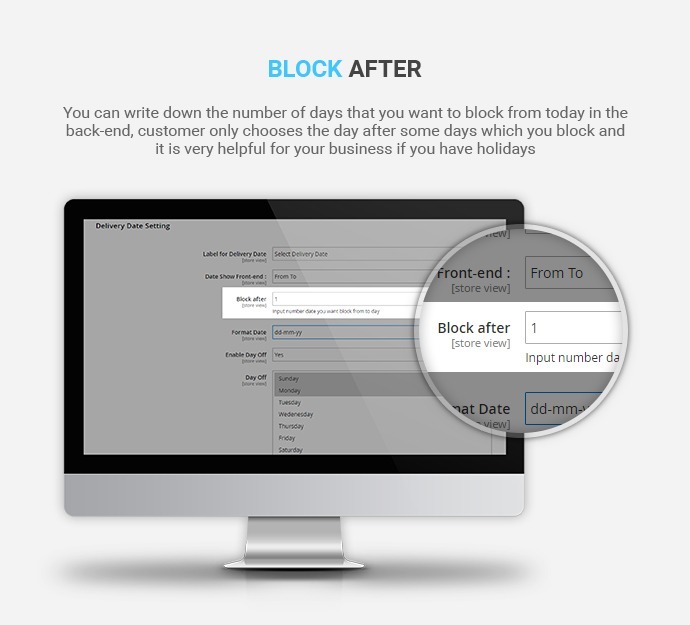 Block After: You can write down the number of days that you want to block from today in the back-end, customer only chooses the day after some days which you block and it is very helpful for your business if you have holidays. Extra information for each order: Admin can view information about delivery date and time of each order right in the detailed order. 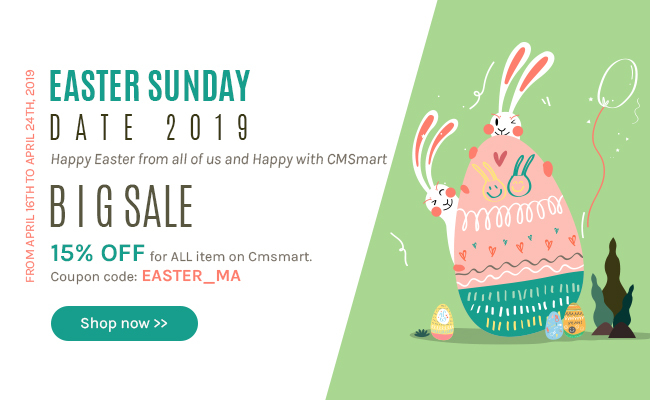 Compatible with any theme: It is easy to integrate this product to any magento 2 theme and it makes your website more professional and attractive. That's so great when using this ext for shipping date function with simple modification to translate file. Our customers have also sent a lot of good reviews for the flexibility in date of shipping. So great! Does it support multi languages? How many options to display delivery date and time? 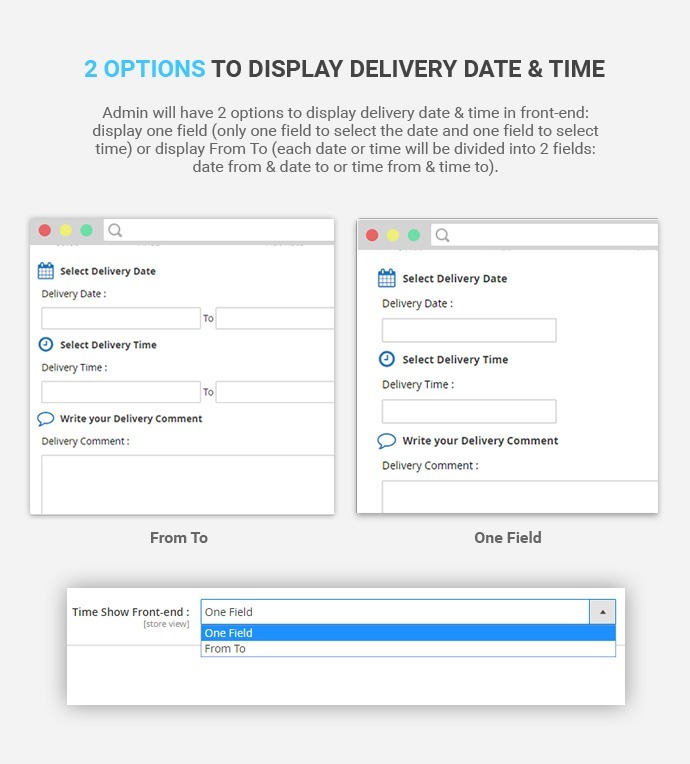 There are 2 options to display delivery date & time in front-end: display one field (only one field to select the date and one field to select time) or display From To (each date or time will be divided into 2 fields: date from & date to or time from & time to). Where can I enable/ disable the delivery comment? Please go to the back-end, choose the Delivery date/ Setting/ General/ Enable Delivery Comment. How many types of the date format setting in this extension? Where can I edit the color of Text Label, title and icon? Please go to the back-end, choose the Delivery date/ Setting/ General and then choose the option which you want to change. Where can I setup the delivery days off? Please go to the back-end, choose the Delivery date/ Setting/ Enable Day Off. How many delivery cities can be setup? You can setup unlimited cities as you want.